Please refer to our stock # cd1 when inquiring. 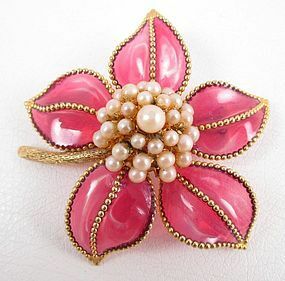 This beautiful vintage pin was made by the renowned French glass factory, Maison Gripoix, for the couturier, Christian Dior. It is 2 3/4" long x 2 1/2" wide and has five pink pate de verre petals with beaded frames. The center has a 4 tier pearl cluster, and the reverse has an attached "1965 Chr Dior Germany" plaque. There is some loss of nacre on the pearl center and there is some internal fracturing on the edges of the pink pate de verre petals. Overall, it is in good vintage condition.